The Seattle Rep stuns audiences with their production of the highly anticipated, evocative drama "The Suit" running March 19 through April 6. "The Suit" subtly draws you in with its unassuming austere set design, intimate live musical score and powerhouse cast, but violently interjects an emotional gut punch which leaves you reeling long after you have left the theater. The remarkable performance forcefully confronts audiences and demands their involvement by removing the luxury of remaining unbiased observers. That is not an option with this production. Based on the short story of the same name written by South African author Can Themba, "The Suit" takes audiences on a wild emotional rollercoaster ride. Challenging our beliefs and inspiring us to reason, “The Suit” compels us to grapple honestly with the messiness of life and people before it expels us back to the world. Leaving us dazed, we are left with a profound sense of respect for those who have mastered the ability to truly forgive others and a deep abiding sadness for those impotent to express their emotions constructively and unable to offer compassion to others. 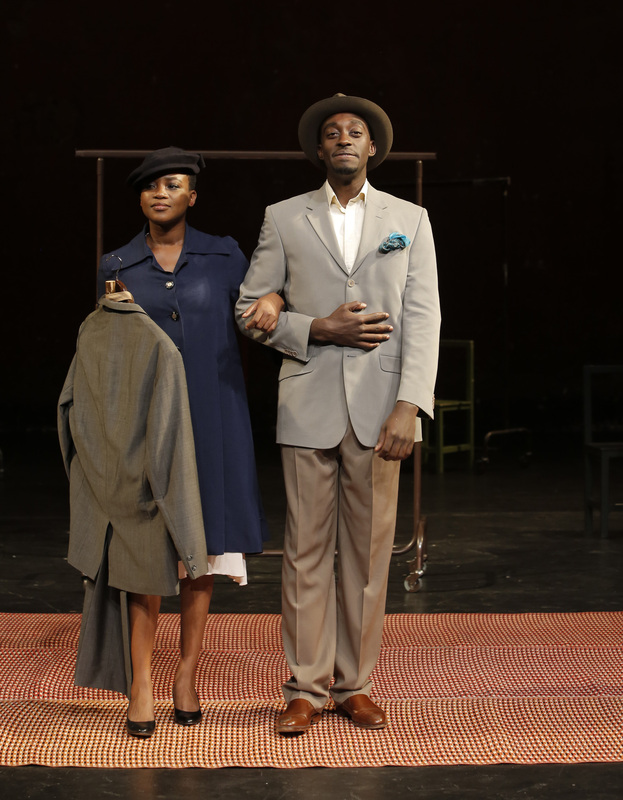 “The Suit” succeeds under the inspired direction of Peter Brook, who hooks audiences with the trifecta of talented musicians, brilliant actors and affable characters only to shake our foundation with an inexplicable adultery. Seattle Repertory’s performance of Tennessee William’s semi-autobiographical “The Glass Menagerie” directed by Braden Abraham is an intimate, thoughtful view into dysfunctional family Americana at its best. It tells the story of the Wingfield family struggling to deal with life in the wake of abandonment by its patriarch. Though absent in body, the father’s presence is never far from the family’s thoughts, as his portrait is hung prominently in their home, an ever-present reminder of their rejection. Told primarily through the eyes of the troubled and restless son, Tom Wingfield, played by the emotive Ben Huber who bears a striking likeness to Adam Levine of Maroon 5 fame, Menagerie compels us to bear witness to a family overwhelmed by the challenges of transitioning to modern society, instead opting to each live in a fantasy denial of reality. We see the mother, Amanda Wingfield (Suzanne Bouchard) a tragic aging southern belle unwilling or unable to adjust to her economic decline, clinging desperately to antiquated southern belle ideals and values in a world foreign to them. She is the stranger in a strange land. Bouchard succeeds wildly in her heartrending portrayal of a deeply conflicted woman out of touch with the times, staunchly defending the way things used to be and generally being a busybody and nag to her children. She is paradoxically unable to accept her children for who they are and yet willing to sacrifice her own pride suffering through the humiliation of being forced to sell subscriptions over the phone out of love for them. At times she is stunningly cruel to them, like in telling Laura who is dressed up for her gentleman caller that this is the prettiest that she will ever be or by complaining that why can’t she and her brother be like normal people. Is it out of love that she seeks to manipulate her children for their own perceived benefit or out of some vain attempt to re-live her own life through them? On Friday, August 10th Studio East followed up its smash summer musical, “Thoroughly Modern Millie” with an opening night sellout of “Godspell” over at the Studio East Mainstage Theater in Kirkland. Boasting a cast of over twenty children and teens, Studio East joyfully takes on one of Stephen Schwartz and Broadways’ most successfully but challenging musicals and succeeds in conveying the heart of the show to an engaged and delighted audience. Clearly Studio East does not shy away from controversial, sensitive or demanding productions. Before attending the performance, I was familiar with Victor Garber’s performance in “Godspell” the movie but was unsure of what to expect from a live production performed by a cast with an average age of twelve. Studio East surprised me right out of the gate, by the provocative decision to cast a young lady (Jordan Williams) in the role of Jesus. Did I mention that they were not afraid to be controversial? I wisely determined to withhold judgment and give the performance a chance, as by the time the curtain closed, I found myself curiously moved by the production. I will speak to this later in the review. If We Are the Sum of the Roles We Play in Life; Who Are We When We Are Not Playing a Role? How does one define their identity and their worth? Is it the roles that they play during this life, their level of activity, whether or not they are in charge or serving in some capacity? What does it say about a person who is very comfortable when placed in charge of something or similarly at ease when serving behind the scenes BUT is clearly ill-at-ease when asked to just be part of something without being asked to be in charge of it or even serving in any capacity? In a meeting over lunch, I was challenged by the observation of a friend who pointed out that he's noticed that behavior in me. This began my meditation and mental wrestling with why I am like that and what that says about my personal assessment of my own value and worth. If all of life’s a stage, what does that say about us when we don't have an active role to play during a scene? Do we transpose this evaluation framework on other people; assessing their value based on what they do or what they might be able to do for us? If you have ever wrestled with something similar, I encourage you to read on and hopefully share your experience(s) with me. You are invited to take a break from your own troubles and spend a laugh filled evening immersed in the pure meshugaas which is the wedding of a Jewish bride and her Catholic groom. Toss in the extended dysfunctional families, the uninvited ex-boyfriend of the bride, two controlling yenta mother-in-laws and the marginalized but ‘please others at all cost’ older sister and you may just begin to scratch the surface of the insanity and drama which is the new musical “It Shoulda Been You”. Written by Brian Hargrove with music by Barbara Anselmi the production runs from March 14th – May 20th at the Village Theatre. “It Shoulda Been You” is a hilarious and entertaining behind-the-scenes view into family life, wedding planning, familial relationships, love, laugher and embracing one’s identity. The songs are catchy and the characters endearing despite their own flawed natures. Performances are top-notch with an equally strong supporting cast. Combined, they will joyfully carry you through all the biting one-liners, plot twists and over the top chaos and quirkiness which is the modern family wedding. There is a ‘laugh or else you might cry’ mindset which pervades the production, as serious issues are called to light, but dealt with in a comical manner. The emotionally stunted father unable to show authentic affection to his son, the mother incapable of recognizing the beauty and value of her oldest daughter, simply because she’s heavyset and yet unmarried, parents who turn to alcohol and the manipulation of their children’s lives to try to compensate for their own less than satisfying marriages and more are all on display in “It Shoulda Been You” and yet we laugh. Perhaps laughter is the best of medicines and certainly preferable to tears, as we recognize ourselves and others in the characters we see. As human beings we all carry within ourselves a myriad of past experiences; some joyful and others painful, each uniquely shaping the way that we make sense of the world around us. All of our life experiences change us. Sometimes the effects are subtle almost imperceptible, while other times the influences are significant and life changing. We are changed, regardless of whether or not we are consciously aware of the impact or not. We live each day, we are altered and frequently, we are forced to develop more and more complex coping skills. These skill are employed on the hope that they can heighten our experiences of joy and lessen our experiences of pain.